The Dutch Open Hackathon announced the following winners after an event this weekend of over 30 hours and with 360 registered participants. Out of the ten finalists, overall winner is Team Caching Issues with their WelcomeHome app, an application to order a 'welcome home' box for travelers. The second prize went to Team DDB & Tribal & Friends with their app Alberto. With this app, groceries can be ordered and delivered by somebody who has subscribed as a deliveryman. The event was organized seven Dutch companies Ahold, Amsterdam Airport Schiphol, KLM, Philips, Rabobank, TomTom and USG People, in cooperation with the Open State Foundation. 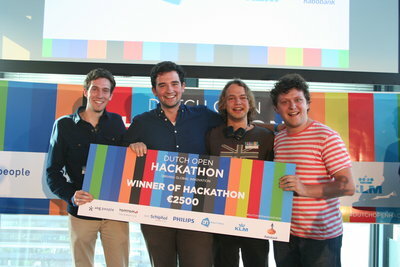 AMSTERDAM - The Dutch Open Hackathon announced the following winners after an event this weekend of over 30 hours and with 360 registered participants. Out of the ten finalists, overall winner is Team Caching Issues with their WelcomeHome app, an application to order a 'welcome home' box for travelers. The second prize went to Team DDB & Tribal & Friends with their app Alberto. With this app, groceries can be ordered and delivered by somebody who has subscribed as a deliveryman. 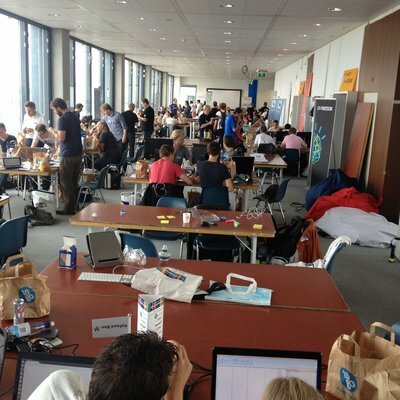 The Dutch Open Hackathon was hosted from Saturday September 20th to Sunday September 21st in the IJ-tower in Amsterdam, The Netherlands. The event was organized seven Dutch companies Ahold, Amsterdam Airport Schiphol, KLM, Philips, Rabobank, TomTom Telematics and USG People, in cooperation with the Open State Foundation. Eventually 50 teams submitted new applications by combining APIs and technologies of the various companies. During the challenge, participants built and created working applications and presented them to a jury consisting of the various companies. "It's the first time that such a group of companies worked together on open innovation. The outcome of this hackathon shows the value of open APIs and technologies to create new applications for consumers and businesses," said Arjan El Fassed of Open State Foundation.